About Go. Do. Be Dog. | Go. Do. Be Dog. Welcome to Go. Do. 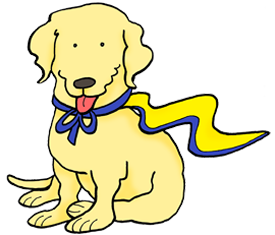 Be Dog., a companion blog to Raising a Super Dog. We’re enhancing the already lofty life concept of Go. Do. Be. by adding the goodness of sharing our home, family and lives with dogs. Ah, more than pets, these canine companions of ours are going about their days to fulfill a purpose-driven life through the human:animal bond. Sure, it’s true. But not if you ask them. Instead, they would tell you tales of courageous derring-do that is only interrupted by regular meal times. I would hope if asked, my dogs would tell you that Life is Made of Good Stuff. Because isn’t that what we all want for our canine partners? The Mighty Micron is certified in Pet Therapy and shares his golden gooberness to those in need of his sunshine rays. He is a “change of career”dog from Canine Companion for Independence. Micron insists on remaining roughly one percent off the Normal Scale of things. You’ll see what I mean. The lovely Holly is a Canine Companions for Independence puppy. We are graced with her puppy presence for the next year as her volunteer Puppy Raisers for CCI. Our job is to socialize this pup and teach thirty commands before returning her to CCI to continue in the Advanced Training program where she will learn the ways to be an assistance dog. Check out Holly’s About Page for more on this California blonde. And then the Jagerhund. Our freaky, little spotted dog. One of those “who rescued who” deals. He is indeed a one-of-a-kind. I’m not kidding. We’re so glad you’re joining us. Want to contact us at GDBD? Pop us a note, won’t you please …. Pingback: So glad you stopped by | Go. Do. Be Dog.